Aaron had been here several times so he was able to help give us some suggestions. I had read up on a few things and knew where I was headed. What the others would choose would be a total surprise. Just like it should be when you go to a food cart pod. 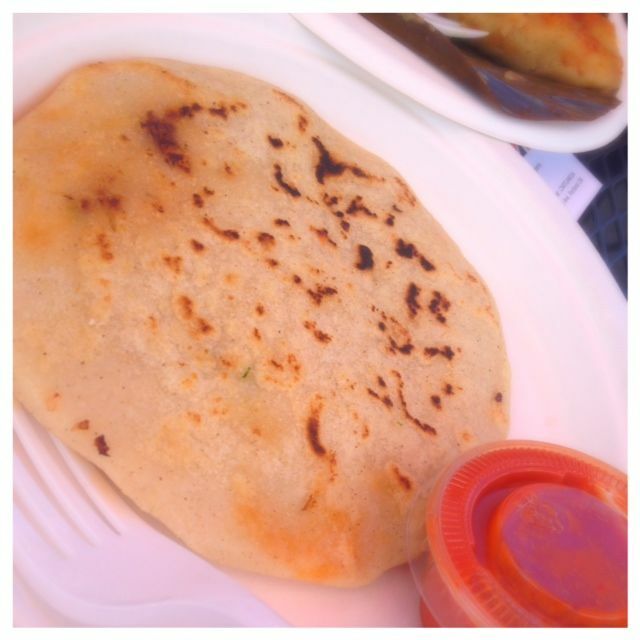 I knew for a fact that I would be ordering Papusas from Pupuseria La Miguelena. They serve authentic food from El Salvador. I loved the Papusas and would definitely order it again. You can read more about my visit here.You can also see what else I ordered, and thoroughly enjoyed. 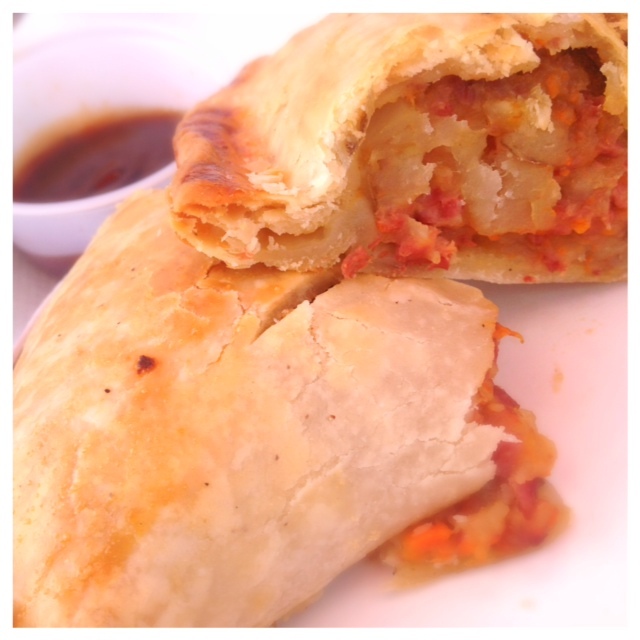 From the London Pasty Company we order the Corned Beef and Potato Pasty. We are suckers for corned beef so we figured this would be a perfect one to order. While we were standing in line a customer came up and said how awesome this place was. She had ordered a savor and sweet pasty and said those were both perfect. A pasty is a traditional British hand pie made with meat and potatoes or veggies and cheese. The pasty was a flaky crust with potato and corned beef on the inside. These things are stuffed clear full too. The meat and the potatoes were both super tender. It was a very authentic English dish. 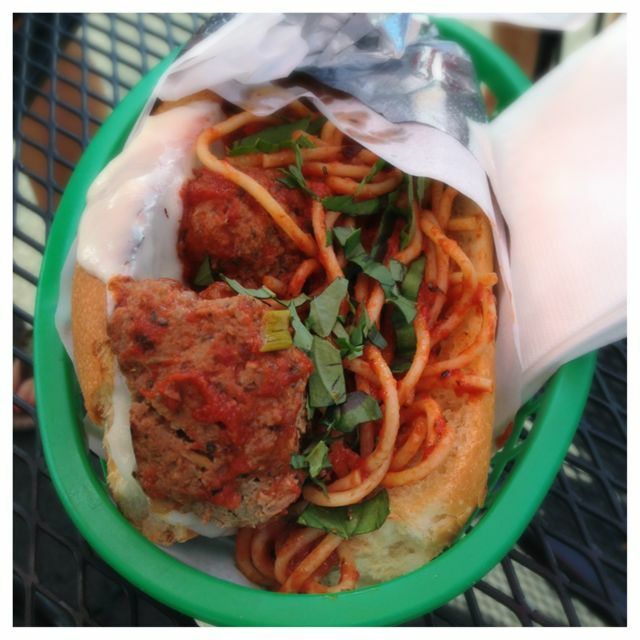 Even Portland Monthly wrote them up as the Best British food in town. I love trying something new, different and authentic. This place was no exception. I only wish we would have saved room to try a sweet pasty. Service was awesome and they were super helpful. Pricing was great. They are so affordable it makes it easy to choose a savory and a sweet pasty. Here it is. 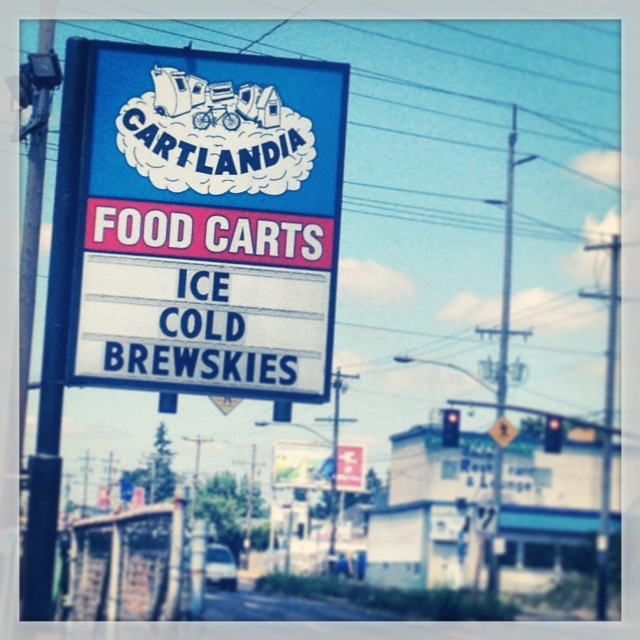 A cart that is all about Chicken and Waffles and as of July ’13, it’s a new comer to Cartlandia. The one we chose had wing and a waffle. The price was definitely right, as it was very good sized. It tasted great, but it was very awkward to eat. I kind of wished we had chosen to get something a little meatier to eat with my waffle. The waffle was great in flavor (which is key) and the chicken was super moist. 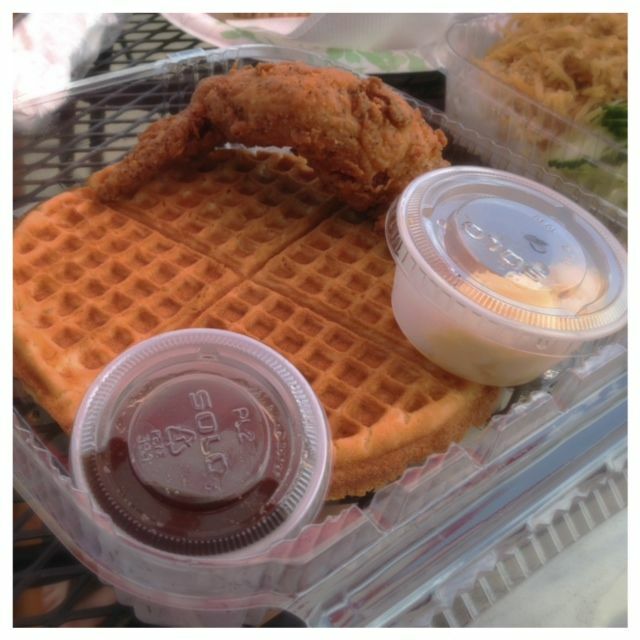 If you go here definitely order a bigger piece of chicken, you will want it to enjoy with the large waffle. Pricing was pretty good. It was about $5-$9. We really went a different way at this food cart. We are pretty predictable with our Vietnamese food, but this time we ordered something we weren’t completely sure what it was. 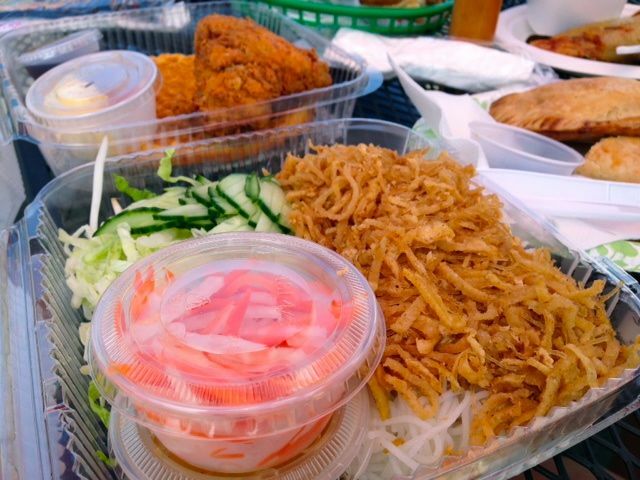 We do like change, so we chose the #10 or the Bun Bi Chay which is shredded tofu on vermicelli with lettuce, bean sprouts and cucumber. It was served with a vinaigrette to pour over it. This was a very simple, yet pleasing dish. The sauce was a must to make this dish really stand out. I was really hoping to try their spring rolls, but was told they are only on the dinner menu. I was pretty bummed about that, because I noticed they were priced really well. This cart is also a new comer to this pod as of June ’13. Pricing was pretty reasonably. I think this dish was $7 and it was a large serving. Service was great. Super helpful and very cheery. Always makes asking questions more fun. This is yet another new comer to this pod as of July ’13. I had done some research on this cart and was pretty excited to sample from it as well. We are suckers for Carnitas, so of course we ordered those. They were super tasty and the handmade corn tortillas we fantastic. There were a few more things on the menu I would love to try like the enchiladas and they one of their burritos. There was a line there if that says anything about this cart. 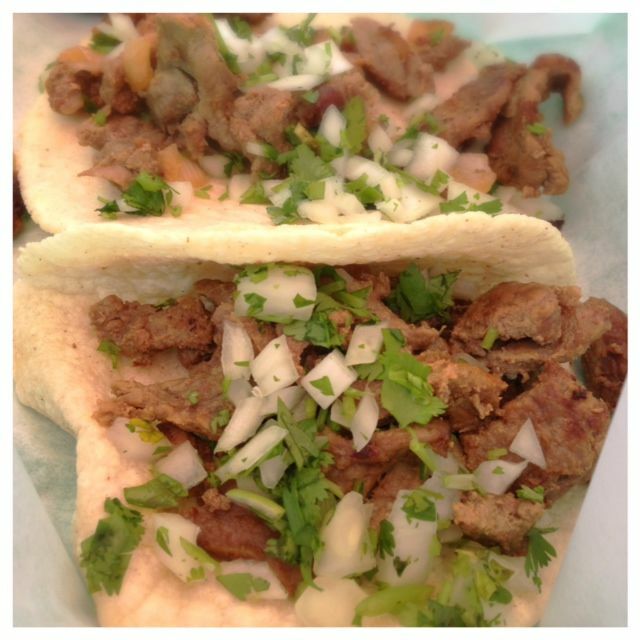 Aaron ordered a burrito with lengua. (For those rookies out there, it’s tongue.) He shared a bite and I did try it. The meat was incredibly moist. Even more moist than the carnitas, but I just couldn’t do it. What is wrong with me? Pricing at this cart is incredibly affordable. You can get fajitas for just $5.95. My tacos were just $1.25 each. Service was great. Super friendly and very nice. This food cart specializes in sandwiches. Wondering what I think of this place? Check out my full review here. Let me just say, they are huge and he does not skimp on toppings and flavor. Make sure you stop by this, you will kick yourself if you don’t. This guy knows sandwiches. Also at this pod is Mother Goose Bakery. We enjoyed a cinnamon roll from her. Pricing is all over the board. You can get 3 steamed buns for Bamboo Garden for $2.50 or a the Apocalypse now from Rock House Grill for $50. Now that’s variety. I never made it to the one your suggested either. I really want to try Good and Evil Wrap, but I want to try his brussels sprout wrap. That one sounds super good to me.